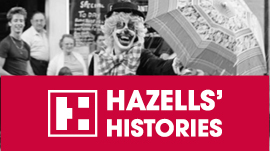 We are bringing you the fourth instalment of our collaboration with well-known local historian Martyn Taylor. 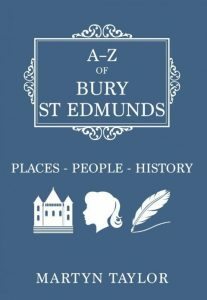 We are reproducing sections from Martyn’s book A-Z of Bury St Edmunds in our monthly newsletter and we hope that as a result subscribers will enjoy the historical reflections of so many parts of this wonderful town in which we live and work. The town’s Westgate used to stand where the ambiguous double mini roundabout is today and was pulled down in July 1765. A profit of one old shilling was made after the demolition materials were sold for £10 10s! Unlike the rest of the town gates where there were chapels to Our Lady a hermitage instead was close by in medieval times. Many years later the shop corner with Guildhall Street was altered to accommodate traffic. 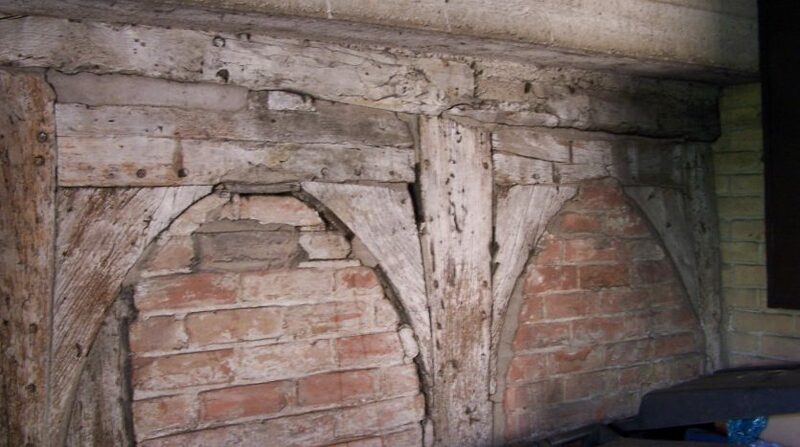 There is still evidence of the ancient timber framed building just visible to the rear of the Chinese take-away (previously a Co-op butchers). 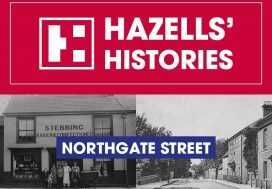 When the corner with St Andrews St South was re-built in the 20thC the cottages here known as Hellfire Corner were also demolished. Another change is that of Turret Close opposite; for many years it was the home of the St Nicholas Hospice until its move to a purpose built unit at the West Suffolk Hospital. A former owner of this Grade II* listed house was John Corsbie (see Corsbie Close). 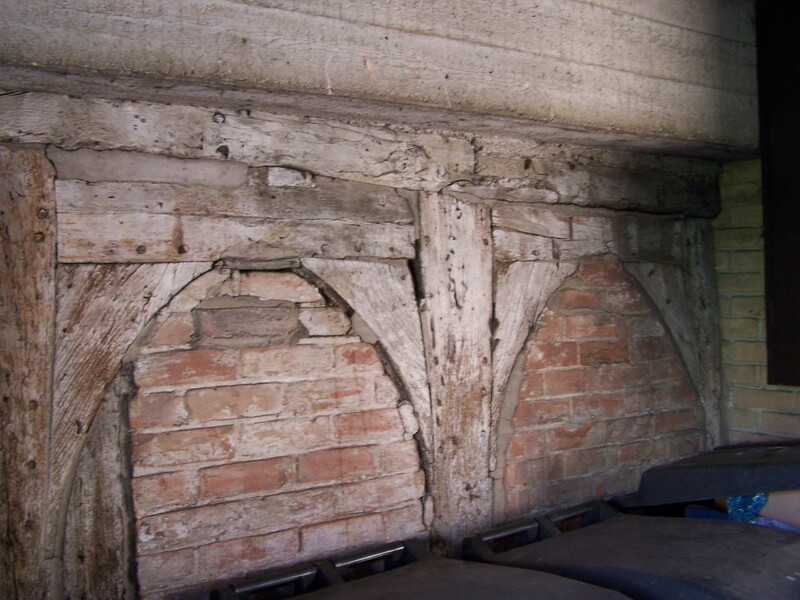 Nearby at no.21 is the Presbytery, from around 1761, of the Roman Catholic Church of St Edmund. Services were held here then by Father Gage and only with the relaxed restrictions of Catholic involvement in public life and more freedom of worship was the church able to be built to designs by Charles Day of Worcester in 1837. In 2014 a complete re-decoration transformed the interior for the congregation, perhaps the largest of any church in Suffolk. Nos.17 and 18 are fine houses whilst at no.19 Edmund Ward a cork cutter lived, his house removed to allow access to the church site. Opposite on the corner with Whiting Street is what can only be described as a ‘real pub’ The Rose & Crown, complete with Jug & Bottle. 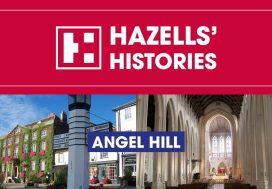 Close by at no.56, is Bernard Batt House, named after a respected surgeon of Angel Hill; once a nurse’s home, it is now the YMCA. 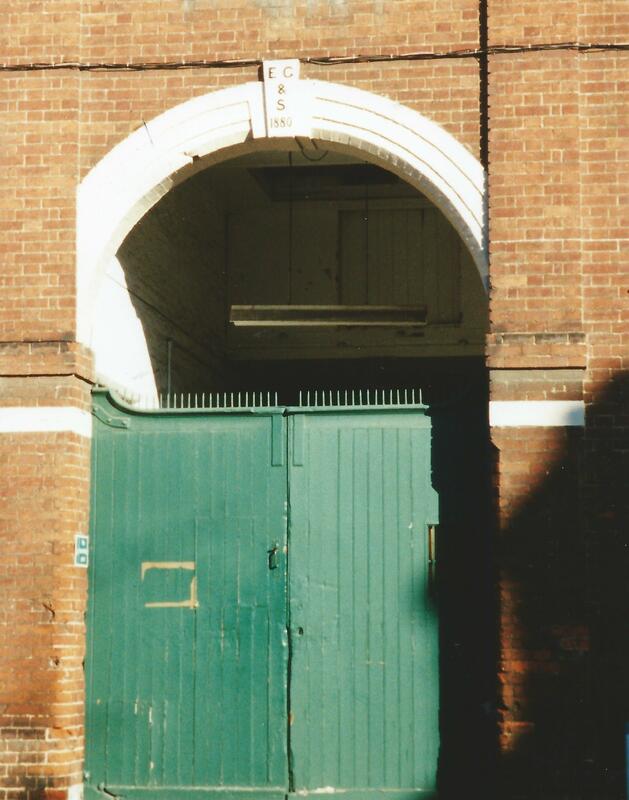 Greene King’s Westgate Brewery dominates the street; its former maltings built by Edward Greene in 1880 being successfully converted to residential use including agreeable extensions in 2004. 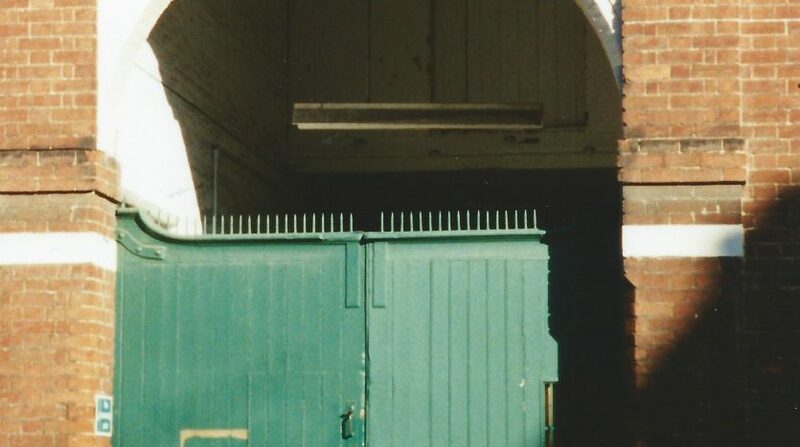 Part of the maltings entrance gate complete with metal spikes on top and postern gate was used as the entrance to ‘Bury Jail’ in the celebrated TV series Lovejoy 1986-94, starring Ian McShane as the lovable rogue antique dealer. Westgate House opposite was E Greene’s home for many years with his first wife Emily who died in 1848. In 1870 he re-married Lady Dorothea Hoste who was the widow of Admiral Sir William Hoste, they had been renting Westgate House for a short while. Edward and his new wife went on to purchase Nether Hall, in Pakenham. The thing was she was an inveterate snob as she continued to use her title instead of plain Mrs Greene even though her husband of some standing was MP for Bury St Edmunds! During the 20thC the top floor of Westgate House was used by West Suffolk County Council Architect’s Dept. Along further is one the gems of Bury St Edmunds, The Theatre Royal. Its architect William Wilkins had chosen this site for the ‘New Theatre’ due to its natural gradient, it opened in 1819. Perhaps the most famous production here was the premiere of Charley’s Aunt in 1892 with its risqué content being tested on a provincial audience; the play was a resounding success. The theatre closed in 1925 languishing as a GK barrel store until it was restored forty years later. As the only working Regency Theatre in the country it is now run by The National Trust thanks to the generosity of GK. Opposite the theatre is the brewery Brewhouse from 1939, alongside the GK visitors centre; the brewery tours from here are very popular. Number One, Westgate Street was the home of Lot Jackaman renowned builder of The Corn Exchange, 1861. He included several examples of his workmanship on his house. Sadly, he died just over a year after its completion in 1884. The text on this page is taken from pages 86 to 88 of the book written by Martyn Taylor, published by Amberly Publishing 2016.